The Guangxi autonomous region will pump tens of billions of dollars into upgrading roads, ports, airports and railways in preparation for start of next year's China-ASEAN Free Trade Area. Earlier this month, China and ASEAN officials signed a third free-trade agreement to pave way for the broader economic cooperation. China's Minister of Commerce Chen Deming said that the China-ASEAN Free Trade Area would be completely operative in 2010 as scheduled. Guangxi, in southwestern China bordering Vietnam, aims to become a transport hub between China and the 10 ASEAN members - Brunei, Indonesia, Malaysia, the Philippines, Singapore, Thailand, Vietnam, Myanmar, Laos and Cambodia. Air travel from Nanning, a Nanning-Singapore land corridor, and sea routes over the Beibu Gulf are expected to facilitate transportation between China and the ASEAN countries. "Guangxi aims to become the most convenient, efficient transport channel to link southern China, including the Pearl River Delta, with ASEAN countries by 2020," Huang Huakuan, head of Guangxi's communication and transport department, told China Daily. The transport hub based in Guangxi is expected to take shape in three to five years, he said. The Guangxi government plans to invest 80 billion yuan ($11.7 billion) to improve transport facilities this year. Projects worth 50 billion yuan started on June 23. More than 700 million yuan were spent on upgrading the Nanning international airport to expand its capacity to handle international flights, Huang said. By the end of this year, the airport is expected to handle five million passengers per year, up from the current 2.5 million. At the same time, Guangxi has started building 14 new expressways stretching 1,437 km, and extending another 10 expressways by 1,093 km this year. The total length of expressways in Guangxi will stretch to more than 2,300 km by the end of this year, he said. "By next year, the freeway network of Guangxi will link up every city," he said. In addition, Guangxi will add more road outlets into neighboring provinces and countries. Some 45 roads will be completed by next year to connect Guangxi with neighboring provinces, such as Guangdong province, and with Vietnam to its south, Huang said. "There will at least nine roads between Guangxi and each of the neighboring provinces, including at least one expressway. Every county that shares a border with Vietnam will also have at least one road leading to Vietnam," he said. 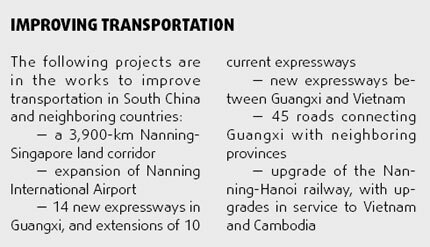 Guangxi is also pushing the progress of the 3,900-km Nanning-Singapore land corridor, which is formed of roads and railways and runs from Nanning to Singapore through Vietnam, Cambodia, Thailand and Malaysia. Though the final route has not been decided, Guangxi has completed a majority of the planned expressways between Nanning and Hanoi in Vietnam and between Nanning and Ho Chi Minh City in Vietnam. Guangxi has reached a consensus with Vietnam to cooperate in building two expressways between Youyiguan of Guangxi and Hanoi and between Dongxing of Guangxi and Hanoi. Projects will also upgrade the Nanning-Hanoi railway and build a new railway between Hochiminh City of Vietnam and Pnom Penh, capital of Cambodia, he said.